Jordan Lee, who fishes for Auburn, holds a 5-lb. largemouth bass he caught at the FLW College Fishing National Championship. The score for Clark and his teammate, Brett Preuett: 17 lb. 6 oz., the top haul of the competition, including that 5½-lb. donkey. Louisiana-Monroe's Warhawks enter the finals in third place. "It's all about the donkey," Clark says, beaming. College fishing. Yes, it's a sport, though it might not carry a ton of clout on campus. "Telling a girl you fish for Auburn is not a good pickup line," says Auburn angler Jordan Lee. FLW Outdoors, the NASCAR of fishing (it's been called BASSCAR), started a college division four years ago. In 2008, some 90 college bass-fishing clubs were scattered across the country. By the end of 2012, according to FLW, there were 610. The team that won the FLW national title took home a $27,000 bass boat plus $3,000 in cash. The champs also get a shot at the 2013 Forrest Wood Cup, the Super Bowl of bass fishing. There, the winner nets $500,000. Bass fishing is a club sport, which means it's outside NCAA regulations. 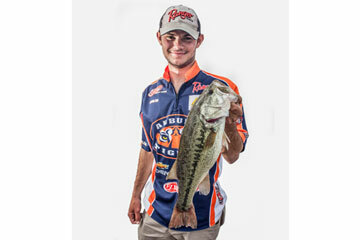 Anglers can get individual sponsorships and win cash in noncollegiate tournaments while still fishing for their school. For example, Miles "Sonar" Burghoff--son of Gary Burghoff, who played Radar on M*A*S*H--says he won some $30,000 in tournaments while also fishing for the University of Central Florida. That about covered the cost of college. Bethel University, a small Presbyterian school in McKenzie, Tenn., even offers fishing scholarships. "The students I recruit are coming here to fish," says Bethel coach Garry Mason, "just like kids go to Alabama to play football." Or to fish. Going into the final day of the tourney, the team from the University of Alabama has the lead. But Angelo State University from Texas trails by just 7 oz. While the Crimson Tide would roll over Angelo State in most sports, fishing levels the field. The bass don't know who's in the boat. Over the next eight hours, however, Angelo State catches only four shorties. Alabama chokes too. Guess the football titles will have to do. Clark and Preuett, the boys from Louisiana-Monroe, look depressed as they leave Beaver Lake. Preuett hooked and lost two fish in the final hour and is convinced he cost his school the title. "You love fishing one day," says Preuett, "and it leaves you heartbroken the next." Back at Walmart, it's time for Louisiana-Monroe to hit the scales. Preuett is ashen. The 49ers of the University of North Carolina at Charlotte are in the lead, and the Warhawks need 11 lb. 11 oz. for the win. Because of the two that got away, Preuett thinks the 49ers have it clinched. The Warhawks' number flashes on the screen, the crowd breathless: 12 lb. 4 oz. Louisiana-Monroe is your national fishing champ.